Beating the retreat is an annual event held at Horse Guard Parade, the large ceremonial parade ground in St James Park, which originated from the war in the 1690’s. The beating of the drums as darkness fell, were used to order the troops still fighting that it was time to withdraw safely to camp. Later it was used as a signal to indicate that the gates to the camp were closing for the day, thus advising of the last chance for them to hurry back to camp. Also, this included the lowering of the regimental flag at sunset. Today, it is an annual concert held after the Queen’s birthday parade or the Trooping of the Colour. As sunset falls, the bands strike up and its showtime for the thousands in attendance gathered to witness this unique display in London. The music is provided by over 300 musician’s, drummers and piper’s. There are military drills of the footguards, some of whom will be mounted on horseback, but they all can be recognised by their distinctive uniforms and elaborate head dressers which are still worn from a bygone. The sound of the drums and pipes, cannons and firework all combine perfectly to create a stunning performance of military precision. This year sees not only the Queen’s Foot Guards and the mounted Household Cavalry but the Pipes and Drums of both the Scots and Irish Guards, the King’s Troop Royal Horse Artillery but also joining in the performance is the troupe de marine band and band of The Legion Etrangere (French Foreign Legion) and the Vancouver Police Pipe Band from Canada making the line up more an international affair. 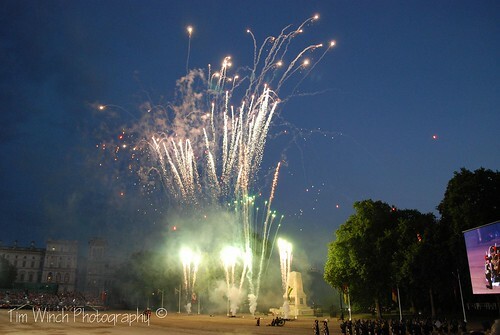 We here at epic love our fireworks and can’t think of anything better to combine them with, nothing makes us prouder than our armed forces put on a display alongside loads of explosions and colour. Nearest train station – Charing Cross or Victoria / Nearest tube Station – Westminster or Embankment. No onsite parking available /nearest car park is NCP Bedford bury. Taxis – these will be restricted and given suitable pickup and drop off locations.